If IT training is an important element of your business, you obviously will want to examine your options with a focus on optimizing operational efficiency and lowering your TCO. Each approach, of course, poses different challenges, offers different benefits, and comes with different cost structures. Which is the best option for satisfying your training requirements and delivering maximum return on investment? Is it even possible to accurately determine your costs? The Economics of Cloud-Based Training, a new report from CloudShare, presents a thorough examination of each approach to help you make the best choice. Following is a brief overview of what’s included in the study. Determining an accurate cost model for on-premise labs is difficult, to say the least. On-premise training relies on a myriad of cost factors with hardware costs atop the list. Additional expenses include operating costs such as floor space, electricity consumption, HVAC systems, depreciation, and maintenance. Given the need to purchase, operate and maintain software, manpower costs are significant—and tough to pinpoint. You’ll find it frustrating to determine the actual cost of a training session and/or calculate the profitability of your training business with the on-premise approach. Moving to a virtual training labs model with a commodity cloud provider—such as Amazon Web Services—eradicates CAPEX. However, it certainly won’t make costing your program an easy task. Pricing structures are complex. Fees are based on computing resources including processing, storage, bandwidth consumption, and more. A common frustration for subscribers is “cloud sprawl,” which occurs when virtual instances are left active though not in use. You must also understand running a virtual lab in the cloud doesn’t remove the need to configure your training environments. Therefore, calculating costs for the approach requires factoring in several IT tasks, including custom training features, which can be significant. Training organizations needing to accurately nail-down the costs of their IT training programs—and realize many more benefits—will go this route. Specialty virtual training lab providers have simple pricing models and make it much easier to determine costs. CloudShare fees are based on an easy to understand consumption model. Given the inherent scalability advantage of virtual training labs and pay-as-you-go pricing, many organizations that have relied on the on-premise model are migrating to the cloud. As we’ve pointed out, this shift can be accomplished with commodity cloud solutions or specialty training labs. 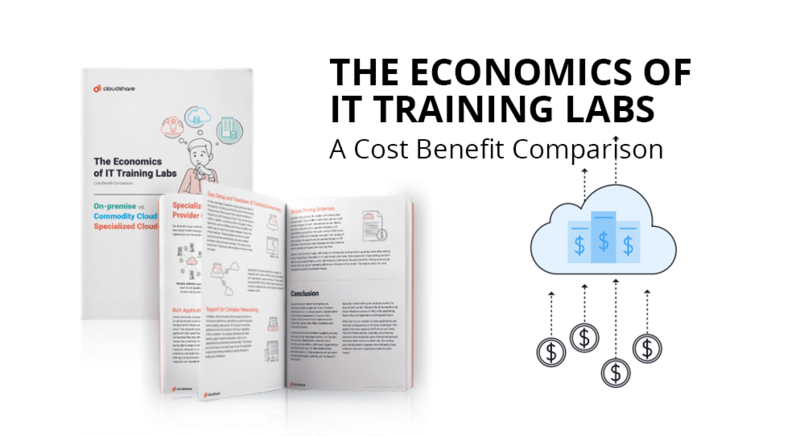 To help you fully evaluate the features and benefits of both approaches and understand their associated costs, The Economics of Cloud-Based Training paper offers a detailed comparison. You’ll find The Economics of Cloud-Based Training a highly useful resource. Click here to download a free copy of the report now.